This blog is dedicated to my own experiences and thoughts around artificial life, virtual life, and related topics such as neural networks. A lot of it will probably end up being about the alife game Creatures, but I will also post about my own simulation, other alife/virtual life programs, and readings related to alife. I welcome any comments, questions, or discussion; commenting is open on all posts and does not require a Dreamwidth account. However, if you have an account on another service such as blogspot, you can use OpenID to keep that identity over here. Why do you like Creatures? If your interest in it has come and gone and come again, what brings you back? Despite how hard it can be to run on modern machines and the total lack of official support now, why do you play? For me, the appeal of Creatures is the appeal of alife: of seeing something new and wondering what it can say about the things we see in the real world, or could in an alternate world. Creatures is alife that has nice graphics. Creatures is alife with complexity - social interaction and learning and genetics and biochemistry and neural net. Creatures is alife I can take apart. Creatures is alife that I have access to. On an emotional level, I love the community and the creative things it's kept coming up with even more than a decade after the last game had an update - like the Garden Box and Magic Words and the recent work on new C2 genomes and CreatureLink and really, I could go on. There's an active and helpful wiki, forums that are rather slower than the heyday but still full of people, and generally everyone is quite friendly. And the creatures. Even now, I still get attached to one occasionally, and feel compelled to help them out when they're in trouble (when it's not my fault). They're frustrating, but they're lovable. My interests wax and wane - don't most people experience this? But some things I leave behind and never come back to. Creatures has yet to be one of those things. It may happen someday; but even now, even when I don't play it much, it keeps popping into my head. It helped inspire me to do a senior project at college, which got me into graduate school - and now an extension of that program is the core of my research project. Thanks, Creatures. Thanks, CC. Thanks, Steve Grand. I'm glad I threw my sanity into the skull-shaped basket with you all (if anyone still gets that joke). What do you think of the mythology and backstory of creatures? Do you have any favorite background details in the world? Any pet theories or thoughts, or questions you would like answered? I've always liked the quirkiness of the Shee, like how they took so readily to genetic engineering and biology, never had a straightforward thought in their lives, and were incredibly lucky, and then left their world for a round one (such a great setup for a game that never appeared, alas). I also re-read the Lone Shee story more than once as a kid, perhaps to make up for not being able to have any of the Mall breeds at the time. I also think that it's a good thing that while there is some of this (not too developed) backstory and myth to the games, you could play without ever looking at any of it and still have some vague ideas - the games, especially C1 and C2, are so atmospheric. As for details and questions (I have lots), let's do this game-by-game. ~Official lore is that Albia has no moon. You might notice that there is a moon. ~What was the windmill used for? Surely it's not just to move the cable car back and forth. ~Behind the garden, you can see what looks like a temple - is it? What happened there? Did the Shee have deities? Was it just a lab that looks like a temple? The musicola area looks like it could be a small shrine, too, or perhaps just a very well-decorated building. ~Who built the Statue of Nornity, and why? Was it dedicated to a well-known Shee scientist who had done something great, or was it made by an egomaniac who built it too large or too fast and doomed it to crumble away? ~I appreciate the drippy-drips in the caves - the sound effect, too. I would also encourage everyone to check out these new photos of the C1 background model, there are some nice details there. ~Again, the temple in the desert - or was it one? ~If the Shee tech looks so nice and shiny and metal, then what was it that we saw in C1? Did they just keep their living quarters much more simple than their labs? That would fit in with the bamboo village area. Or was it all built over by someone else - perhaps even a few Shee who survived the volcanic eruption but lost all their access to their old technology? ~There's this one little room just above the Shee statue that's clearly someone's leftover office, and I love all the details in it. ~What's with the gold next to the Shee statue? Donations to a god? Taxes? The entire fortunes of all the Shee? ~Where are the Shee living quarters? On the Ark I guess you could squint and say those rectangles in-between the Aquarium and Desert doors are Shee-style doors, but on the Capillata? ~You know that easter egg with the star in the Norn Terrarium? That's my favorite easter egg in the series. ~Was it really, truly necessary to bring along piranhas, an artificial volcano, and two airlocks? Sheesh, the Shee truly didn't have any sense. ~If you've never read the Help for the ship's lungs, do yourself a favor and check it out. Technobabble at its finest. ~There's a nice little drawing in the kitchen in the Norn Terrarium. ~What was Shee daily life like? What did their society look like? Surely they couldn't have all been scientists working away every day... could they? ~For all the talk about tea and biscuits, there isn't a single teacup in the whole series! We didn't even get biscuits until quirky cookies! ~We had a discussion about this on CCaves a while back, but what even is the Hand? My vote is an AI with a pocket dimension upgrade in C3, meant to help take care of norns and ettins. Do you create content for Creatures? If so, what sorts? What do you use to make things, and what would you like to make in the future? If not, what would you like to make if you could? I primarily make agents for C3DS, though I've tried out gengineering before and have branched out to the other games for my CCSF submissions. Also, I made a metaroom once! I also edit the wiki sometimes, if that counts. Art is done in Photoshop, though I tend to use freely-available sprites when I can. Everything else is the usual set of official tools and Bobcob and so on. One thing I use sometimes that I'm not sure is popular is the CAOS debugging tool - who else uses it? It's not mentioned in tutorials and so on that I remember, but it's quite useful for more complex agents, especially if (like me) you're used to using print statements for debugging. C1: [stuff related to my main CCSF submission] and making the hummingbirds do more. C2: More plants, and maybe more critters for creatures to eat. A teardown of the evolving pidgeons. Colortrue C2 creatures, if that would work. C3DS: The second version of Desert Ruins, with ecology fixes/new plants/a new feature for the beetle/sound effects/music/etc. A metaroom with a Japanese theme. A snowflake patch 'plant'. An annoyance fix for the DS injection screen. My own version of the corpse cleaner. Doing something with some of the incomplete sprites you can find in the image folder. I also have this written in my list but I'm not sure what it is anymore! "magic words drop food? drop things in general?" What? Misc: I have a folder in my bookmarks for wiki pages I want to add or expand (usually creators whose works aren't fully up). I'm not going to run out of projects for a while. This seems like a good time to remind everyone that we still need submissions if you can put one together! What COBs/agents/breeds/metarooms/etc do you use the most? What would you like to see more of? Less of? What pet peeves do you have with add-ons? What do you love to see? I use a lot of sprite breeds because I like having a variety of appearances for my creatures. In C1, I prefer the complete '97 santa over the 'classic' one to the point where I'm thinking of making an overwrite to free up a breed slot, and the Wood norns get a lot of use, too. In C2, I love love love the Uriel norns and the Pegasus ettins! In C3DS, um, please don't make me choose. I use different breeds in different worlds. For genetics, I primarily use CFE and Canny creatures, like probably everyone else. I've been experimenting with C1 genetics but haven't settled on anything quite yet and want to try out the TWB creatures more, though. In C1, I use some COBs that expand the treehouse area and open up some new travel routes around the world, and I always use the garden cob that adds food to the bubble dome area of the island, and usually other new food sources as well. In C2, I use the Plato's renovations to open up the world, again, and almost always use the Volcano Garden COB to make the volcano into a blooming paradise. I used to use the hollow coconuts to provide more water sources; now I use the fountains. I also like to expand food options with the popping mushrooms and the meat vines in places where plants won't grow. As for DS, I'll just link to the Anodyne. I use MW room edits a lot, too. I used to inject the Norngarden and Bug's Temple into everything but aquatic-themed worlds; recently I've stopped using them quite as much and using more of a variety of metarooms. I would like to see less brain-unfriendly COBs or agents (this is why we have the development standards). Also, for C1 and C2 in particular, I don't find single-use injectable food items to be useful. I much prefer plants or vendors of some kind. I would like to see more Garden Box releases, and more critters for carnivorous creatures to crunch. In terms of genetic breeds, I like seeing quirky or strange genetic breeds, such as ones that photosynthesize or whatever, especially if based on real organisms. I would dearly love to see more grendel and ettin sprite breeds, and new kinds of geats. If we're asking for the moon, for that warp restoration project to work out! I like anything that has interesting or cute graphics, or unique behavior, or which fixes bugs or annoying aspects of the games, or which adds nice little features. One of my pet peeves is recolored versions of official sprites taking up a breed slot - with the one exception of the C1 Albian Greys because that's more of a way to get around the C1 color limitations. Even then, I personally prefer the snow norns. There are some C2 breeds, too, that are just recolored Hebes or Golden Deserts with some bad editing, and I don't use those. I do appreciate well-done edits. On the topic of breeds, ones that don't have different ages - at least child and adult - with the exception of those with a 'lore' reason (such as being mechanical, for example). I'll still use them, however. I'm also not too picky when I comes to agent art, but (and this is mostly a problem with C1 addons) things that look like they were thrown together in thirty seconds in old MS Paint do not get downloaded by me. Lastly: metarooms without CA links. I shouldn't have to add those by hand! I do recognize that this is something people are more aware of now than they used to be, though. Similarly, anything that throws errors or glitches out in strange ways that the creator should have caught. Aquatilis Caverna, or maybe the second one, throws errors sometimes, and there's a plant that I do use sometimes that has a bad habit of somehow putting seeds behind that little panel in the upper-left corner for some reason @. @ It's okay if things don't always 100% work - it may not even be the creator's fault, I know there's at least a couple of glitchy engine scripts - but most things can be caught by just injecting the COB/agent and letting it run for a while. How has the way you play Creatures changed since you started? What has stayed the same? Do you play a different game more, have you picked up a different play style, have you thrown out one species and embraced another? For a long time, I played C3DS almost exclusively. It's still the one I play the most, but now I spend more time with C2; the ecology and graphics of that game are my favorite. C1 I play on and off, but I think at about the same level as I have since I've owned it. When I was a kid, I used to be a lot more into nurturing-style play, and one way I would do so is that I would use the selective force field to keep babies, and usually children, in the incubator pan area, so I could teach them and keep an eye on them. I would usually put an older norn in with them, too. I've been thinking of trying something like this again, actually, although with something a bit more norn-friendly than the force field. Nowadays I also do more wolfling and feral runs than I used to. Also, I always used to install the Norngarden; I've had problems with plants from there dying out, and the pond kills creatures, and there's a larger variety of rooms available now, so I only use it sometimes. I only cared about norns as a kid, and even now, I don't care that much about grendels. I do make my worlds grendel-friendly in C1 and make sure they have food and toys, but for C2 I still remove the grendel mother most of the time (the default sprites for them are bad and they die so young) and disable it in C3DS. Like I mentioned yesterday, I did try to do a grendel wolfling run, but it didn't work out that well. I do have a newfound love of ettins, however. Their big eyes and round bodies are just so cute! Plus, they have some nice breeds - it's a real pity that the snail ettins don't work better, because they're great, but the striped ettins in C2 and C3DS, the pegasus ettins of C2, the rain and cheese and poodle ettins for C3DS... there are options, which I like. Geats weren't really a thing beyond Gaia and the C1 Shee when I was a kid. I've now tried out a couple of Geat breeds and I think they have their own charm, though they're quite different from each other. Also, now that I can code, using CAOS - even just to make quick little scripts - is like part of the gameplay for me. CAOS is actually my second favorite of the programming languages I've learned (the first being Python) - yes, it has some annoying features, like not being able to name your variables, but the logic of how it works just clicks with my brain, and it doesn't, for example, have the curly braces of Java, the confusing points (and curly braces) of C++, or the strange decisions of R (error message weirdness; and why do the arrays start at one?!). One thing that has stayed the same is that in C3DS, when I get bored I often get out the inseminator to make a new batch of eggs from the most adventures or interesting or pretty norns. In C1 and C2, I always tend to leave the toys, for example, where they are placed by default, and the last time I opened it up to play rather than to test I had to almost force myself to try moving them around to different places. The reason for this is that when I was younger I hated 'messing up' the world... but if the norns did it, that was okay somehow. In all of the games, I tend to keep different genomes separated instead of mixing them up, but different species in one world are okay. How would you describe your playing style? Do you have lots of worlds, or a few? Do you have strict wolfling runs or do you individually nurture your creatures, or both? Any particular habits or quirks? In C1, I usually coddle my creatures a bit, spending lots of time with them individually, encouraging them to mate if they're being slow about it, and so on. They might get left alone for a while, but the last time I tried to do a C1 wolfling run, even with lots of extra food injected, it was a disaster, and I haven't tried again. In C2, I have one world series for a canny ettin wolfling run, though I can't help myself from intervening sometimes, and will often hatch spare eggs, teach them their most basic vocabulary, and then after twenty minutes or so shove them out of the incubator chamber. Based on certain criteria, ettins may be exported. I also have a nurturing norn world where I've been trying to get my norns to be a little less stupid, which, yes, I know. Otherwise, I mostly breed them for looks - Frog norns crossed with Golden Desert norns are adorable. In C3/DS, I never play C3 standalone, mostly because I don't currently have a working install. I can do docked worlds just fine, though. I have one concept world poking along for Pearl Mermaids, where each pod gets a 'queen' female who is the only one allowed to breed - I originally had this for aquanorns, but they have a few issues and aren't CFE. The only problem I've had so far is: when a queen dies, surely I should hatch eggs until I have x females and make them compete with each other to be 'queen', but how? Maybe a more elaborate IQ test? First one to the Meso wins? I also have a 'hospital' world for caring for sliders, rightwalkers, severe limps, etc, until they die. It also serves as the home for my strangest genetic experiments and crossbreeds. It's very much for-fun. I have a KT Saber norn world, but I haven't played it in a while. I remember I was getting frustrated with the norns refusing to eat or something like that. I also can't figure out any of the KT recipes, to the point that I'm wondering if I'm clicking the right place on the cauldron. I had a long-running (200+ generations, 300+ hours) wolfling run world for norns, but it's on pause for the moment. I wanted to try making some of the norns CFE and breeding that into the population, but I discovered that their color genes had gotten very glitchy to the point that the normal genetics kit won't open their genomes. Might be a consequence of breeding Amanora genomes for too long. I'll fix them some day. I also had a grendel wolfling run, but for some reason it wasn't very successful after a while, and the grendels gradually died off. I have thought about running it again now that I have more breeds downloaded and no longer use a couple of the rooms that were present in this run that might have worked against them. I've also discovered a better way of moving creatures around the world, or at least, it works for the norns I tried it on. Other ideas I've played around with: an arena world (creatures fight to the death; winners get to make babies), multiple kinds of migration worlds (including inducing migratory behavior via genetics and some code), and I've thought about a Geat world but haven't committed to one yet. I've also been thinking of making a Creature Link world that's a bit more nurturing, since I haven't played that way in DS for a while. As for particular habits, besides injecting everything included with the Anodyne, I like experimenting with different arrangements of metarooms and connecting them in different ways. In C1, there a cobs that add extra spaces and make the world more connected, and I use several of these in addition with more permanent food sources. In C2, I love love love adding new plants, especially when I make the volcano into a garden, and also new critters, and making my own ecosystems. I do this to some extent in DS, but not quite as much. Also, I am strict about naming my creatures alphabetically by generation. How did you get into Creatures in the first place? What game did you start with? What intrigued you about it or was the most fun? Do you have any special or fond memories? I got into Creatures (many, many years ago now - back when Albia 2k was still up, back when the Gameware forums hadn't been shut down, back when the VLforums still existed, back when you could still trade creatures and chat with random people on DS) because I absolutely loved virtual pets and related games as a kid. There were points were I was obsessive about them. I played Petz. I played Babyz. Eventually I would pick up Pinna (a virtual bird game). I tried out that one Aquazone game where you could breed colorful guppies. I had multiple games where the point was to be a vet and treat pets, zoo animals, or wild animals. I even had a real cat and yes, I did play with her too. At some point I found a website about virtual and artificial life - I think it was called the Virtual Life homepage - and right next to a page full of links to virtual pet websites, FinFin, and gobs of Tamagotchi, was Creatures. I remember spending a while reading the official page, then downloading DS as soon as my mom would let me use her computer (which must have fit the requirements better; I did play on my hand-me-down Windows 98 at some point, but she had XP and an LCD screen!). Norns were never as cute as the roly-poly adorable kitties of Catz. But I still played for hours with my copy of DS (soon with a whole bunch of add-ons, of course). Eventually my parents bought me the Creatures Trilogy for my birthday, but DS - now with C3 docked - was still my favorite. We also borrowed a copy of Creation: Life and How to Make It from the library and I read it together with my dad. I was already learning how to program - mostly how to do things with numbers - and this was an introduction to a new and different way of thinking and coding to me. We skipped the neural network chapter at the time because it was too advanced for me, but the parts about feedback loops and coding an environment and getting emergent behavior rather than hardcoding everything, those stuck with me. I liked playing with the creatures and taking care of them and breeding them - genetic systems have always been a huge, huge source of fascination for me, and continue to be so - but as time went on, I was inspired by other community members to start investigating some of the science background behind the games. At this point I wasn't quite getting into CAOS - though I do remember trying - and I only poked at genetics, but I did set up some experiments within the game to see what would happen. Besides watching my little colony in the Meso, I have fond memories of one particular little norn who I hand-raised. I taught her words by hand, though I was frustrated by not being able to teach her verbs. At some point I think she must have refused to eat or otherwise do what I wanted her to do and out of frustration I started slapping her a whole bunch. Much to my surprise, it turned out that a creature could die from slapping. Oops. Please make sure you have read the entire readme before you install or edit either of the two Anodyne files. This tutorial only covers how to edit the files, because I thought some people might like to have pictures showing exactly what to change. I would be very surprised if you have the exact same preferences for everything that I do, and there is probably at least one thing included in this by default that you don't like. Maybe you want your engineering icon after all the terrarium icons. Maybe you use a different autonamer. Maybe you have another twenty agents that you want to inject into almost every world that you make. Here's how to make that happen. Open up the .cos file you want to edit - I recommend CAOS Tool, or at least Notepad++, but a normal simple text editor (Notepad, gedit, etc) will work as well. Making changes is not hard, even if you don't know any CAOS! However, because these files have permanent effects on new worlds, please test your changes on a temporary new world. I highly recommend making both an undocked and a docked test just to make sure that no errors pop up and nothing happens that you don't want to happen. If you don't want something to be removed, look for the line that says 'kill off ____' where ____ is the thing you want to keep. Either comment out the three lines following it (the ones that say enum ___, kill targ, next) by putting a * in front of them, or delete them. This example shows how to keep the file from deleting the knowledge stones from your worlds. Here x y z is the classifier number of the object you want to kill. If you don't know it, open up a world, hit ctrl-shift-t, and hover the hand over the object. Three numbers will come up on your screen. Record those three numbers and plug them into the 'x y z' exactly as they appeared in the game. 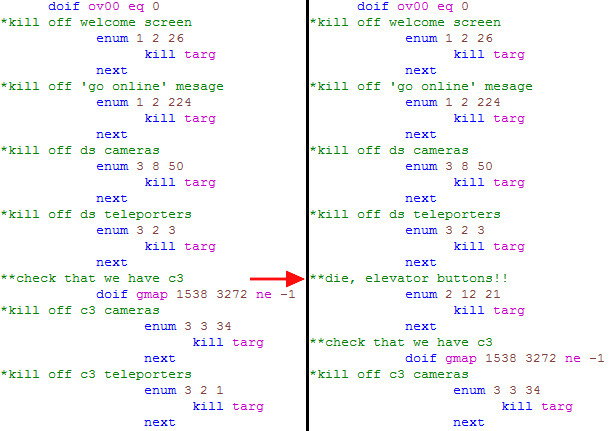 In this example, I added the classifier of the DS elevator buttons (maybe if you wanted to raze everything and use Elevines instead?). You probably didn't need this image, but it's here for the sake of completeness. If you want your room icons to be in a different order, go down to the part that says 'move camera to hallway' and then has a bunch of lines like this: cmra 6143 8998 0. The 'cmra 6143 8998 0' part is telling the game where to point the camera, so to change the order of your icons, you just have to change the order of those lines. I recommend changing the comments as well (the lines starting with **) to describe the new order, to keep from getting yourself confused. For example, if you wanted to have the Workshop icon be second, not the hallway icon, you would find the cmra line for the Workshop (cmra 4611 9039 0) and put it where the cmra line for the hallway is (cmra 2469 9046 0). Then you would take the cmra line for the hallway, and put it where the cmra line for the Workshop used to be. It is possible to change things around so that C3 icons can come before DS icons, as well. This shows the above example. This file is actually easier to change than part one, woo! It also has the potential to cause errors. Be careful when modifying it! Keep in mind that agents do not need to be in alphabetical order; I just did that to make things easier for me. If you don't want to automatically add one of the agents in the file to your worlds (or you don't have it, etc), all you have to do is either comment out (add * before it) or take out the line that says 'sets va01 ___' (where ___ is the name of the agent), and the same to the 'elif ov00 eq ___' line just before it. You can also remove the comment (the line starting with **) if you want. Then, you must change all the following 'elif ov00 eq ___' lines following it to subtract one from whatever the 'eq ___' number is for every agent before that line that you removed. For example, if you wanted to take out Autovocab, you would comment out or remove the lines 'elif ov00 eq 3, sets va01 "Autovocab"', and then change the next line 'elif ov00 eq 4' to 'elif ov00 eq 3', the next 'elif ov00 eq 5' to 'elif ov00 eq 4', and so on. This is annoying, so if you want to add other agents to automatically inject, I recommend doing that first to minimize the amount of renumbering you have to do. This shows the above example. Note the changed numbers; you have to do this for all of the following 'elif ov00 eq ___' lines. Two more notes on removing agents from the file: first, New Gadget Dropper has three lines you need to comment out or remove, because it actually has to be removed before it is injected. Make sure you get all three lines if you don't want it. Second, if you want to remove Wetness, please make sure that the lines 'doif gmap 1538 3272 eq -1, tick 0, endi' are not removed. If you remove New Gadget Dropper, make sure that the line 'tick 0' is not removed. This shows what it would look like if you removed only Wetness and New Gadget Dropper. There are two ways to add more agents to the list. First, you can replace one of the ones that's already there, if you don't want to inject that agent automatically. To do this, just find the name of that agent, then replace it with the name of the one you want to inject. The name must be exactly the same as it appears in the agent injector! 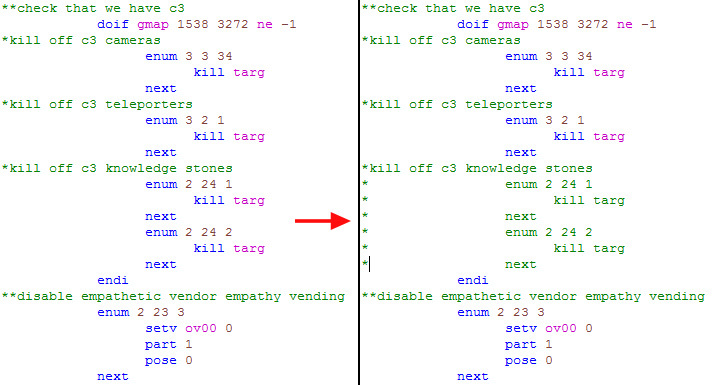 For example, if you wanted to inject an agent called 'Foo' (its exact name in the agent injector), and didn't want the HLM Patch, you would change the line 'sets va01 "HLM Patch"' to 'sets va01 "Foo"'. Again, very simple, but this shows the above example. Where x one more than the number in the previous 'elif ov00 eq _' line, and the text between the quotes in 'sets va01 "___" is the name of the agent exactly as it appears in the agent injector. You will also have to adjust all of the 'elif ov00 eq _' lines after your new addition to add one to the number for each new agent you add to the file. This shows adding a new DS agent and a C3 only agent. You can add as many extra agents as you like. Before you try out your new file, please check that in all the lines of 'elif ov00 eq x', there are no numbers skipped (going from 'elif ov00 eq 4' to 'elif ov00 eq 6', for example) and there are no numbers that are listed twice. If you get errors, first check the numbers to make sure that they are in order and that no number is skipped or appears twice. Second, if you changed out any of the agents or added new ones, make sure that the names are exactly as shown in the agent injector (the DS one for DS or C3/DS agents; the C3 one for C3 only agents). Third, make sure that you didn't accidentally add a C3 only agent before the 'EVERYTHING AFTER THIS POINT is a C3 agent;' line. Good luck! I hope you find these files useful and are able to modify them to suit your purposes. There's a lot of genomes out there for C3/DS besides the ones that come with the game. I've noticed that new people especially sometimes get confused by what the differences between them all are and which ones they should use in their worlds, so I wrote this guide to the more popular genomes to help clear things up. Standard: These are your bog-standard creatures that come with the game. Usually, people take the default Chichi genome as being the default. This is because it has additional genes to deal with the networking features introduced to DS as well as some biochemistry tweaks compared to the original C3 breeds, and as it came with the free game DS, it was also the most widely-available genome back in the day. Note that the default C3 norn breeds (Civet, Bruin, and Bengal) have an additional 'expressive' variant available to them in the egg creator – if you use the standard genome, you will probably want to use this one to play, as it's actually a fix. Originally, the norns did not make the appropriate facial expressions to express their mood properly, and the expressive variants are a fix for this. The standard genome has quite a few bugs in it, and some of the other genomes are attempts at fixing these bugs, while others simply aim to introduce new features. Gizmo: Gizmo norns were an early fix for many problems in the standard genome. They have many modifications, but to summarize: they have a rebalanced biochemistry, a modified reproductive system to make them less likely to become super-breeders, and changed instincts to make them survive better but also to try and make them less 'pre-programmed'. Because of these many changes, they probably won't interbreed well with other genomes, though it won't necessarily be fatal to try. Amanora: Amanora made some beautiful new breeds for C3/DS, the Dream Norns, Butterfly Norns, and Flora Norns. These also used a modified base genome that included changes to the pigment and pigment bleed genes so that creatures would keep their color throughout their whole life (normally creatures can mutate so that they change colors in different life stages), and changes to the pose genes to reduce the chance of getting creatures with limps and other bad movements. Unfortunately, because of these changes, her breeds can't interbreed well with standard creatures – they're likely to produce sliders. Because of this, Amanora used to have a pack with this modified base genome for all the official breeds, but this no longer appears to be on her site. CFE: The name stands for 'Creatures Full of Edits'. These are a major fix that was widely adopted in the community and by breed makers. There's a lot of changes, and these include: working friend-or-foe lobe that allows creatures to make friends and enemies, better memory and learning, a new brain lobe that allows creatures to perceive the elevation of an interesting object (so they don't go after things they can't reach), as well as several fixes to prevent behavior loops. They also cannot get stuck on a life stage or live without eating, and will not mutate to severe limps. CFEm: These are the same as CFE creatures, except they lack a few of the changes: they can still get stuck on life stages, mutate to live without food, and their gait genes will mutate like a standard creature's genes will. CFE and CFEm creatures are compatible with each other, but breeding them with standard creatures might result in weirdness and is not recommended by the creator. Some older breeds may not have CFE conversions available, but some do. CFG: The name here standards for 'Creatures Full of Gizmo'. As one might expect, they combine both the changes from the gizmos and the CFEs into one genome. CFF: This name stands for 'Creatures Full of Fixes' and builds upon the CFE genome. It includes both additional fixes as well as new features. CFF creatures will be aware of being full (so they don't just eat everything in the ship in one go), will react when drowning, and shouldn't breed as quickly as CFE and standard creatures do. They will also hallucinate when ingesting chemical 130, and are meant to act more curious and try more random things. Evo: The Evo norns are an offshoot of the CFF project. They are meant to mess around with objects more and have a shorter attention span than normal creatures. CFF creatures are relatively compatible with both CFE and CFG creatures. Evo norns can be interbred with CFF norns. A couple of older breeds have CFF conversions available. TWB: This name stands for 'True Warmblood'. These creatures, based on the CFFs, have a real internal body temperature, unlike normal creatures. This body temperature is affected not just by their surrounding temperatures, but also things like the creature's diet and activity levels. They also have a few other changes related to instincts, fixing and finishing the hunger system, and fixing some other issues. Because of their extensive changes, they do not interbreed well with other genomes. Spice: In this genome, based on the standard one, pigment genes are spread out through the genome, rather than being all bunched up together. This means that offspring inherit a mix of the colors of their parents, instead of only inheriting all of their color genes from one parent. This means that, for example, a blue creature and a red creature can have a purple child, instead of only a blue or a red child. Spice norns should not be interbred with other genomes because of how their genes have been re-arranged. Colortrue: This genome is based on the CFE creatures and was inspired by the Spice norns. Similar to the Spice genome, Colortrue genomes have been changed so that the children inherit a mix of the colors of their parents. Colortrue creatures should also not be interbred with other genomes. Farbe: This genome is also based on the CFE genome. Farbe creatures have been changed so that their pigment genes cannot mutate, but their pigment bleed genes can, which allows for more realistic and better-looking color mutations. Farbe creatures can be bred with standard CFE creatures. These are only some of the more common genomes; there are many others out there to try, such as the Curiosity Norns, not to mention a whole host of new breeds that come with their own unique genomes. ...so what should you choose? That can be a difficult question, and it depends on a lot of things. What features do you prefer? What are existing breeds available in? How compatible will different breeds you like be? Remember, though, that you don't have to choose just one genome and stick with it. If you don't want sliders and severely messed-up babies in your worlds, you can either keep creatures with incompatible genomes in separate areas, or use different genomes in different worlds. For example, I usually use CFE creatures, but I have one world full of Colortrue norns, and I'm trying out the TWB creatures in another. I even have some Amanora genome creatures in a very old wolfling run world of mine. I would seriously recommend getting at least the CFEs or CFEms; they are a great improvement over the standard genome in terms of learning and behavior, and the vast majority of newer releases are based on them or a genome based on them. If you really like the idea of the Gizmo biochemistry changes, you can get the CFGs. Whether you want to get CFFs or Evos is dependent on how much you care about the additional changes to their behavior. Maybe you are interested in the realistic internal temperature of the TWBs. And, if you really care about realistic color mutations or inheritance, Farbe or Colortrue creatures might be best for you. On the other hand, if you really like the look of an older breed, you might be stuck with the standard genome or a modification based on it... unless you or someone else converts it, of course. The best thing to do is to try several of these genomes out, and then observe your creatures to see how they behave and what you like!